Copyright © 2010 American Geophysical Union. In this study we evaluate teleseismically determined focal mechanisms and epicenters for earthquakes along the Macquarie Ridge Complex (MRC) from 45°S to 61°S and 155°E to 168°E, a region characterized by some previous investigators as undergoing subduction initiation. From 65 centroid moment tensors reported by Harvard, we develop statistical guidelines for choosing 26 which represent better determined, more reliable focal mechanisms for tectonic analysis. Although thrust mechanisms occur in the north, near Fiordland, elsewhere along the MRC the better determined mechanisms virtually all indicate that present-day motion along most of the MRC is strike-slip. This is consistent with sidescan sonar and multichannel reflection data collected between 50°S and 57°S on 1994 and 1996 cruises; the active plate boundary zone appears to be quite narrow (< 5 km wide), and no active compressional features can be observed on the seafloor. 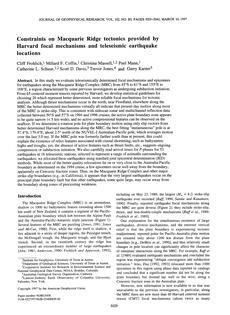 If we determine a rotation pole for plate boundary motion using only slip vectors from better determined Harvard mechanisms along the MRC, the best fitting "instantaneous" pole is at 57.4°S, 179.4°E, about 2.5° north of the NUVEL-I Australian-Pacific pole, which averages motion over the last 3.0 my. If the MRC pole was formerly farther south than at present, this could explain the existence of relict features associated with crustal shortening, such as bathymetric highs and troughs; yet, the absence of active features such as thrust faults, etc., suggests ongoing compression or subduction initiation. We also carefully read arrival times for P phases for 53 earthquakes at 16 teleseismic stations, selected to represent a range of azimuths surrounding the earthquakes; we relocated these earthquakes using standard joint epicentral determination (JED) methods. While most of the better quality relocations lie on or very close to the Australia-Pacific boundary as determined on the 1994 cruise, a few epicenters occur well away from the boundary, apparently on Cenozoic fracture zones. Thus, on the Macquarie Ridge Complex and other major strike-slip boundaries (e.g., in California), it appears that the very largest earthquakes occur on the principal plate boundary fault but that other earthquakes, some quite large, may occur away from the boundary along zones of preexisting weakness.